This book appealed to me from very first sight…without even knowing the synopsis, it just stood out. The cover screams haunting and creepy and it’s a perfect fit for the book. Once I had read the book description, I was caught hook, line and sinker…what an incredible premise! I was intrigued. Identical twins is always a fascinating topic to the majority of us who can only imagine what it is to experience such a bond and likeness to another human. As a mother, I’ve wondered how parents of identical twins can tell them apart, especially as babies, and how often it may happen that identities get switched accidentally in the first weeks of life. 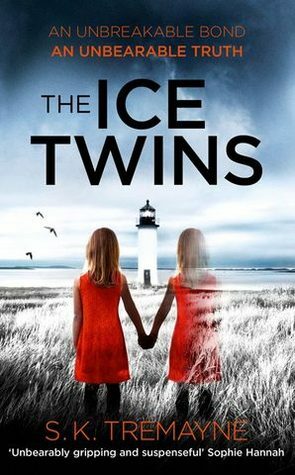 The Ice Twins takes my wondering a step further, what if one twin were to die and you couldn’t for sure say which one? It’s a chilling thought, and deep down I felt it was also terrifyingly possible. Combine this with the ethereal vulnerability of the surviving twin, so hauntingly conveyed by the author, and The Ice Twins quickly became an intensely disturbing page turner. S.K. Tremayne also does a good job of creating suspicion and doubt around the dysfunctional adults in this book. They’re both painted in a bad light to be honest, intentionally to deepen the mystery and drama and leave the reader constantly second guessing just what was going on. The remote Scottish island setting gave another atmospheric layer, and with vivid descriptions along with photographs at the beginning of each chapter, I could almost feel the isolation of the eerie old lighthouse cottage. I was tense while reading, with my heart pounding and every creak of my house and rattle of the windows from the wind causing me to jump. There were a couple of little issues which slightly stopped this from being perfect however. Firstly, while it’s obviously the author’s intent is for us to mistrust the characters of Angus and Sarah, sometimes my dislike for them distracted me from what I was reading. Especially Angus, who quite honestly came across as an arse at times. Secondly, I’m happy to suspend belief when necessary, but occasionally too much suspending was required and I found it difficult to believe that either of these parents wouldn’t be actively seeking professional help sooner, or indeed any of the minor characters involved. Those two complaints aside, I really enjoyed this book. The unique premise, atmospheric setting and chilling character/s of Lydia/Kirstie made it compulsive reading. If you enjoy a psychological thriller to keep you awake at night…then this is for you.